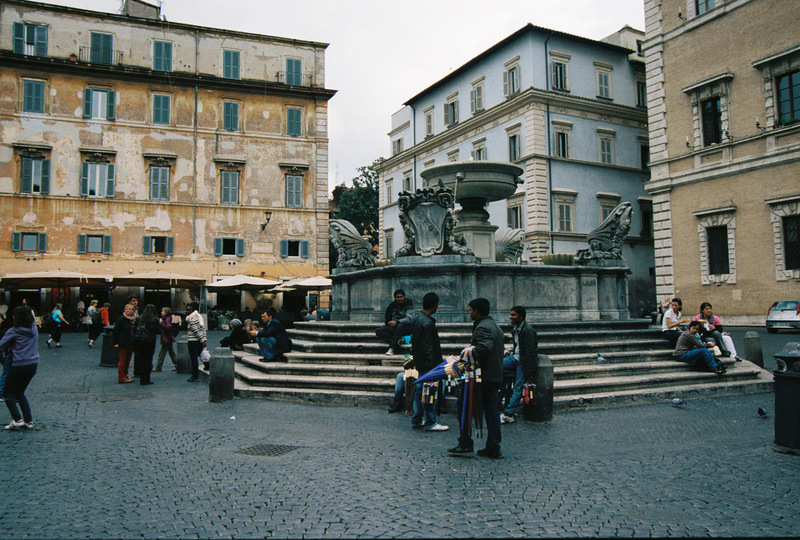 Image | March 22, 2013 April 3, 2013 | a love letter to rome and italy! I had one shot. I couldn’t blow it. 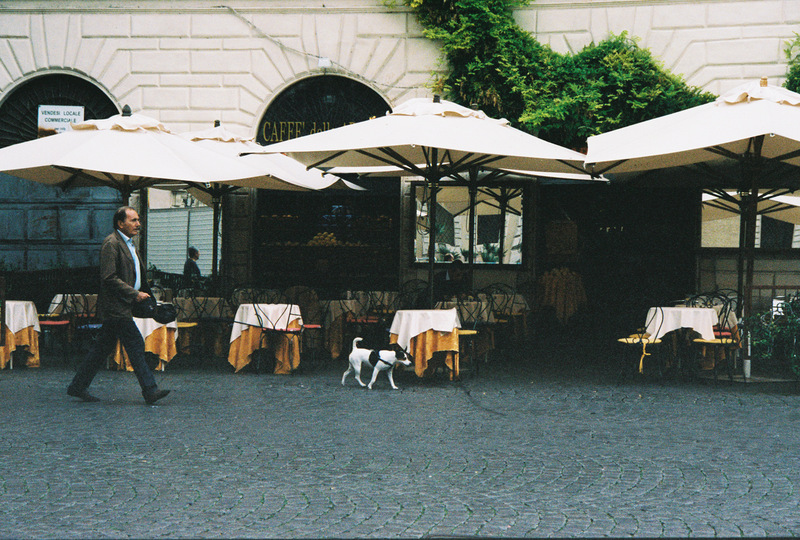 I wanted to hide and be invisible and take his portrait across the piazza. I had one frame. And then it would be lost, the moment, the intensity of feeling, his direct gaze before self awareness gets the best of him. He gave me more than I could have hoped for, my Neapolitan. My soldier. I cannot hide from his direct gaze. 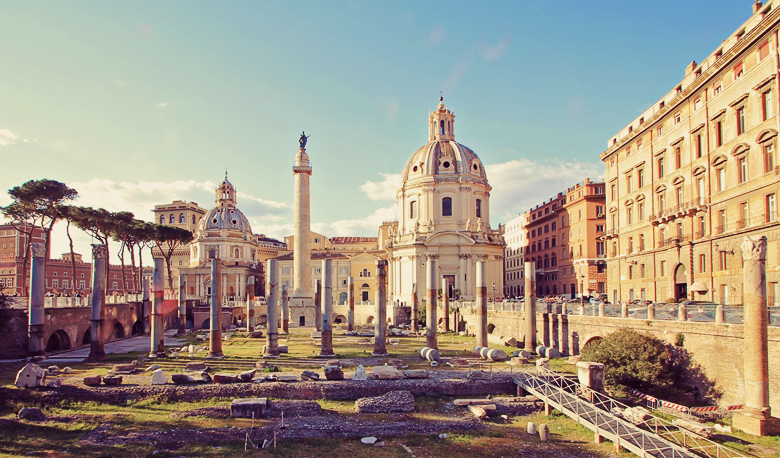 Image | March 19, 2013 | a love letter to rome and italy! 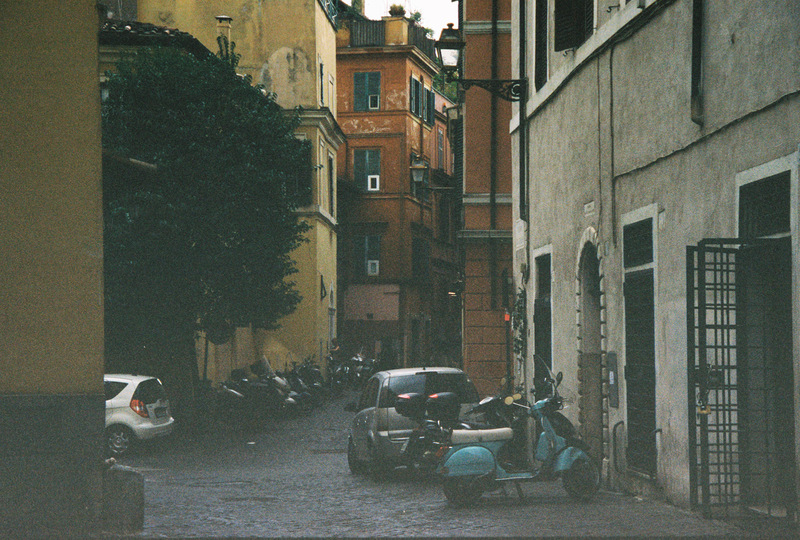 I have thousands of photographs (digital images and film shots on digital files) I am pouring over for this blog and the strictly photo tumblr connected to A Love Letter To Rome. I found this shot of the ruins and cupolas bathed in pink and gold to be a temporary antidote to living in a snow-covered, rainy, icy, slushy, terminally grey winter which is stretching itself past the first rite of spring tomorrow. Since I have so many shots on multiple hard drives, it’s taking me a while to sort them and organize them for posts. 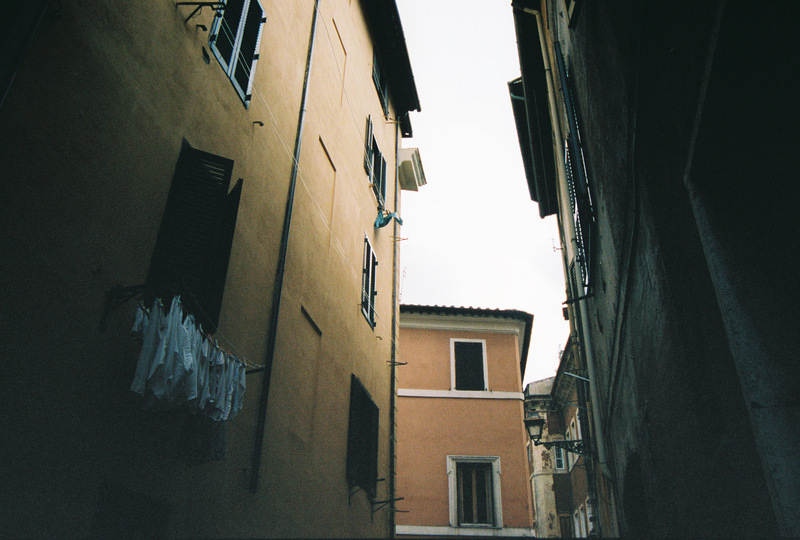 My main vision for this blog is moments in Italy, a walk, drinks at a cafe, a neighborhood, a painting, a quote, a sunset – some long and detailed, some short and simple. For my upcoming return to Napoli in May I am compiling arts and culture listings for museum exhibitions in Italy for day trips. Revealed Rome good reviews! great articles! The Pines of Rome “Exhibits on Now” – great blog!! The Titian exhibit at the Quirinale looks great. I’ve seen nearly all those works at one time or another, but not housed together under one roof. 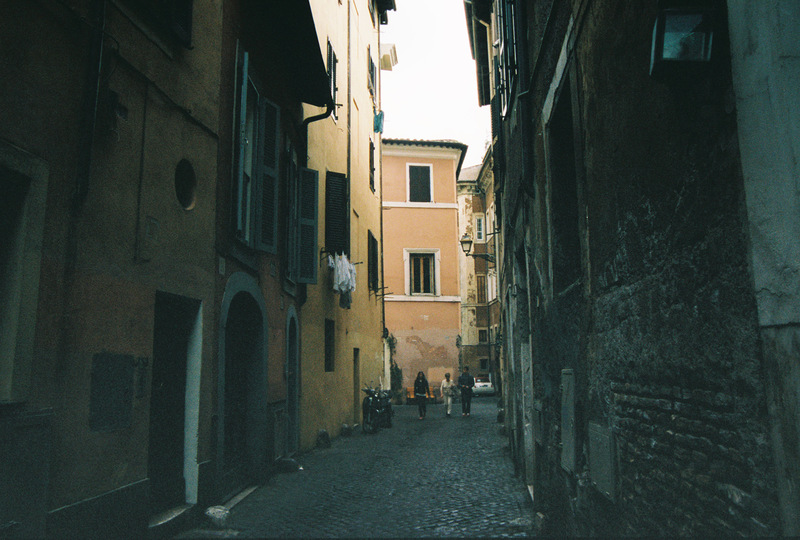 Image | March 18, 2013 March 22, 2013 | a love letter to rome and italy! Interesting church interior and only public bathroom for miles. Looking down at the entrance of the San Sebastian Catacombs from within it’s garden. 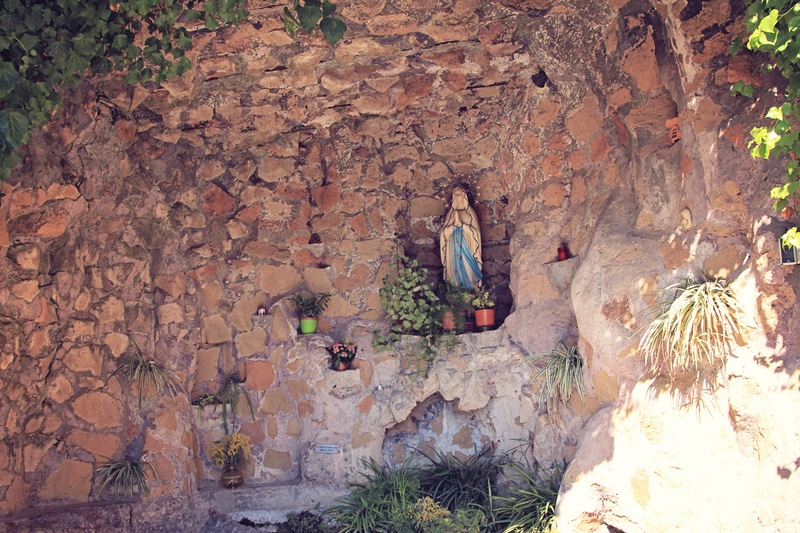 A garden prayer niche at the catacombs. 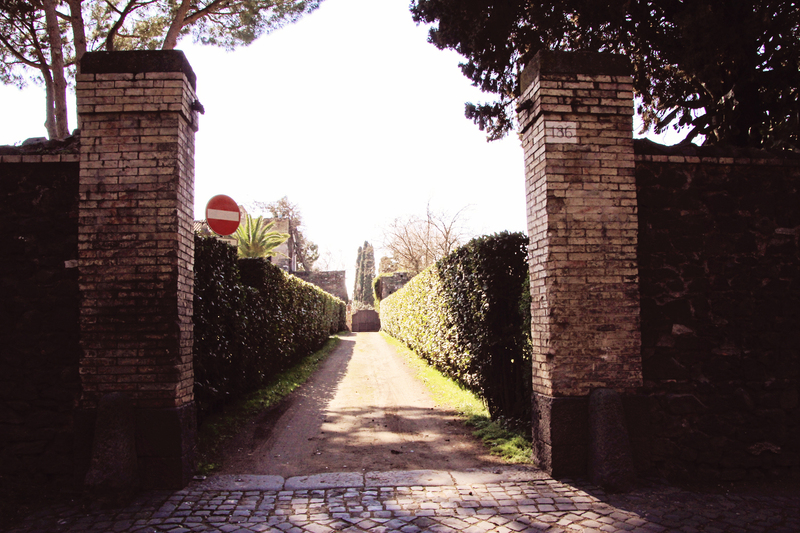 One of the many enchanting gates leading to the Appian Way (Antica – ancient part). It’s amazing to see how people live among the ruins and the ancient villas and gardens of the most ancient of roads in Italy. 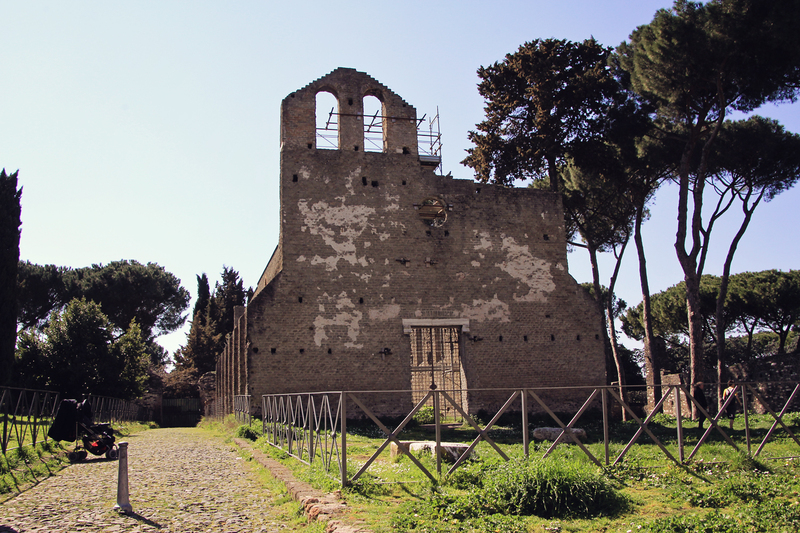 “The Mausoleum of Cecilia Metella (not a castle), and is said to have been built in the second half of the 1st century CE”, some steps away from the Catacombs. (Thank you, Misera e stipend città! That was lazy recall on my part! That’s one of the things with photographing so much and not taking notes – I forget the specifics! I need to start taking a tiny pocket notebook and a pencil with me like I did in the 1990s/early 2000s. And this is particularly sloppy writing as I made a big deal out of finally seeing Cecilia Metella last March, too)! Here is an excellent site on Cecilia Metella’s Tomb and the San Sebastiano area of the unchanged Appian Way! The walk is well worth the effort, very pleasurable on a sunny, warm day. 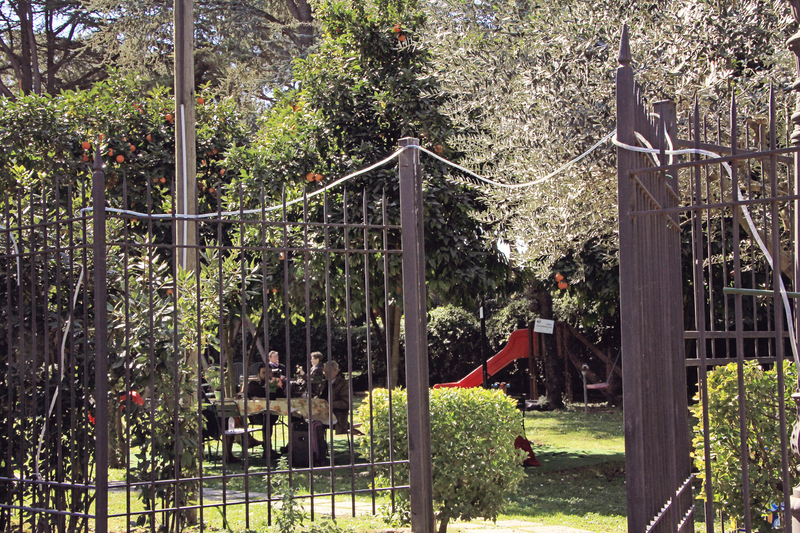 There are a few scattered cafe restaurants and a playground amid an orange grove. More palazzo ruins and curiosities among the cypresses. There are even some museums and art exhibitions featuring the the changing and not so changing face of the Appian Way. 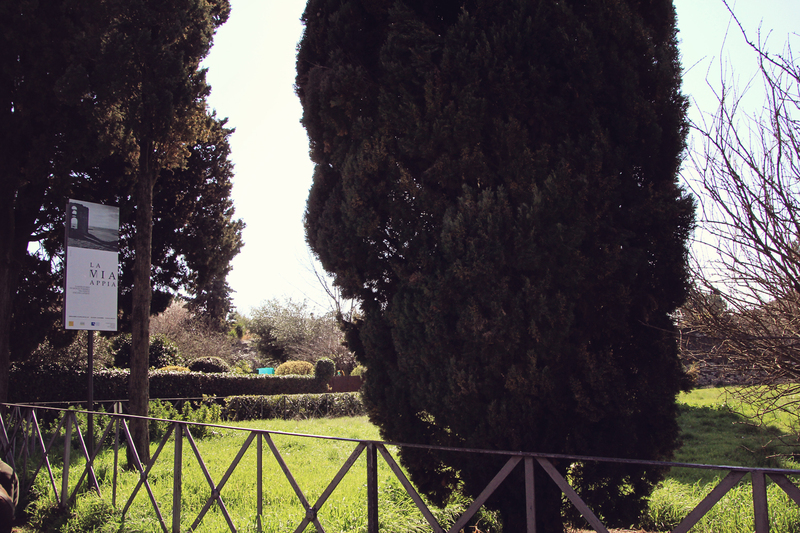 There are villas and open gardens to wander in from ancient Roman times. 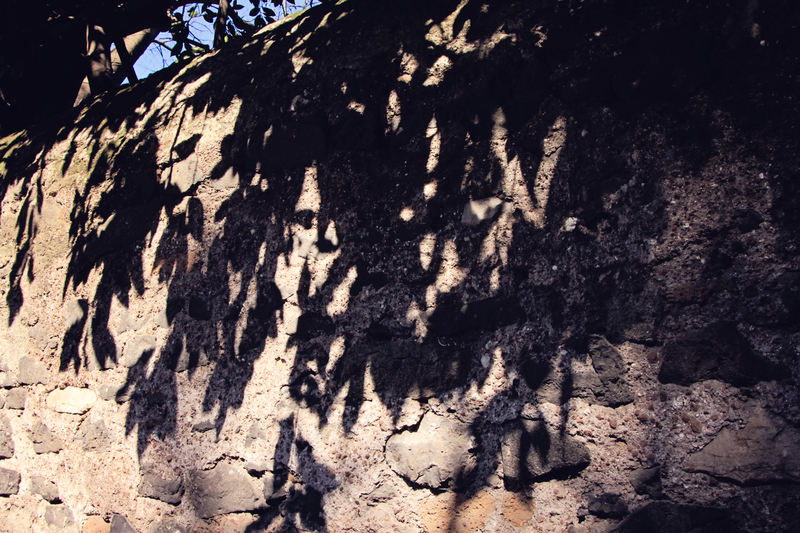 Shadows of overhanging greenery on ancient and medieval walls. 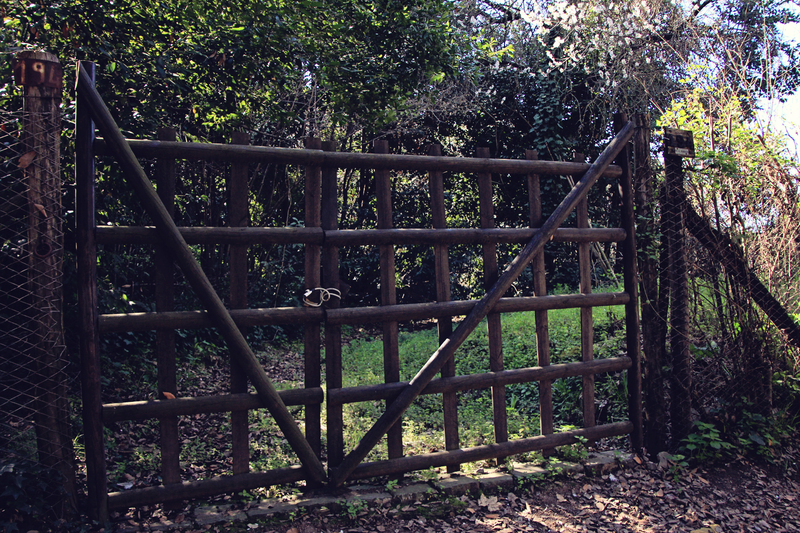 Behind the gates are private gardens and residences one can only envisage in imagination. 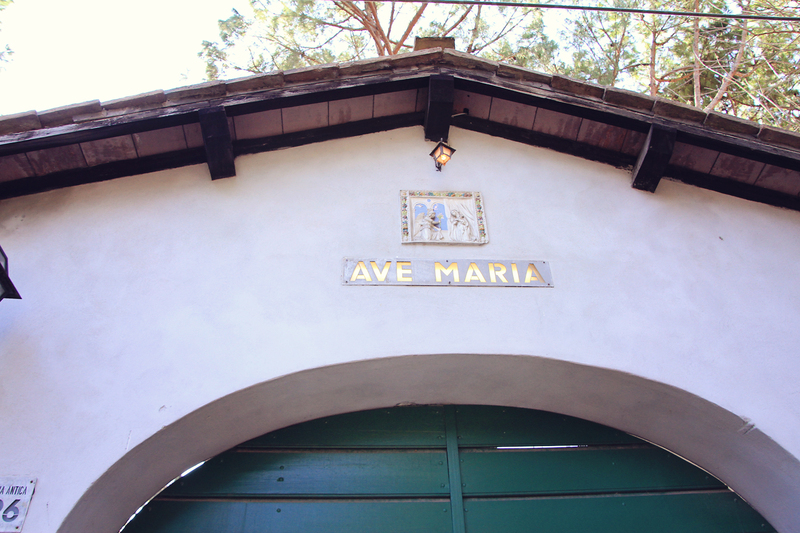 A building on the walk with Ave Maria. One of the many beautiful old houses blending the ancient, medieval, Renaissance and modern world. How many families have lived here in all these centuries?? 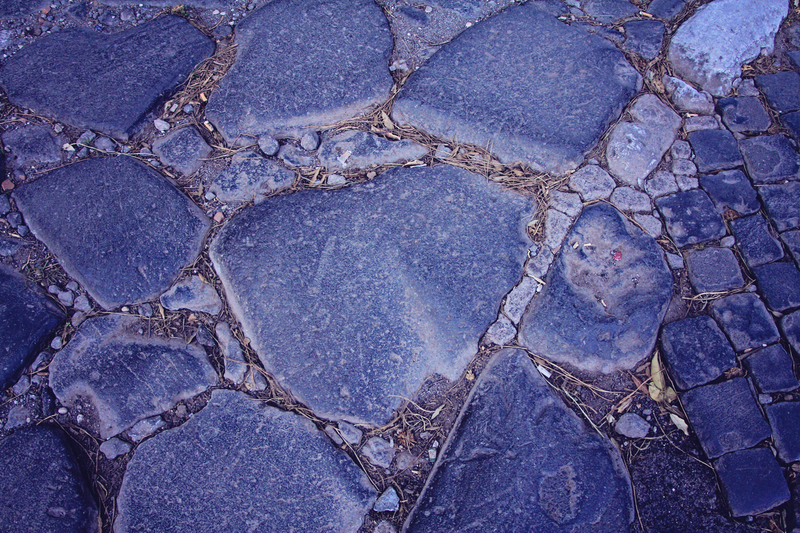 Chariot wheels and horse drawn carriages formed grooves over the ancient road leading to Rome for thousands of years. 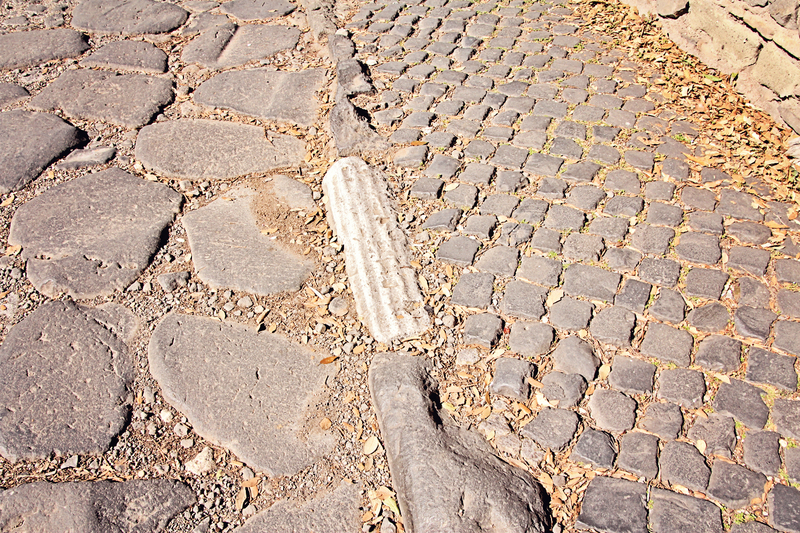 Fallen and broken pieces of ruins and columns and cobblestones worked over centuries into restorations on the Appian Way. A trattoria along the way. 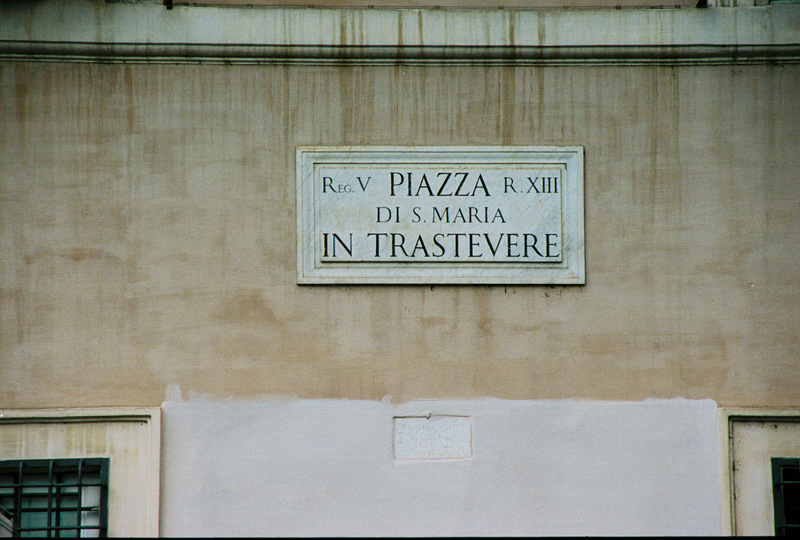 The sign reads Here No-One Ever Dies (thank you Misera e stipend città) – read a poem set on the Appian Way and refers to this very “tavern” by Marie Luise Kaschnitz, translated by Alexander Booth. I love learning thats what the sign says. Next time I must go in there for a drink and a bite! Maybe some ancient luck will rub off on me. There are so many roads left to travel, so many places to wander. 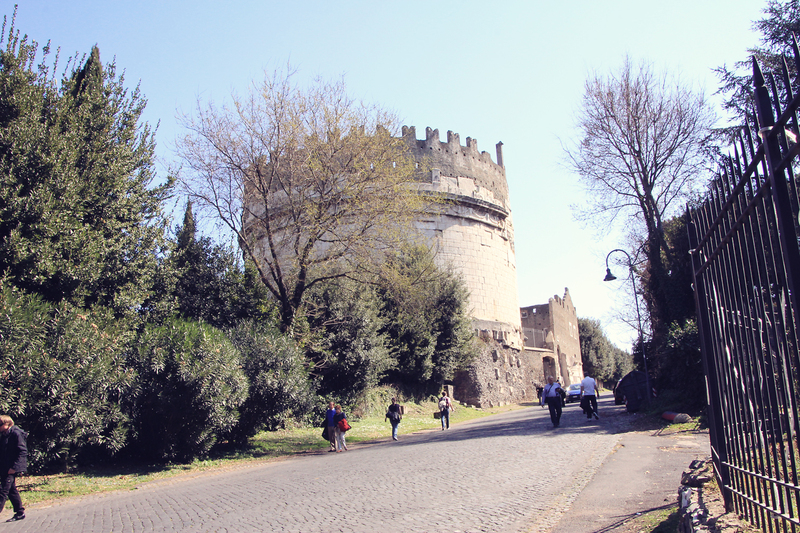 If you find yourself in Rome on a Sunday when the cars are off the road and the weather is pleasant and mild, I cannot stress to you how wonderful a long half-afternoon or afternoon stroll on the Appian Way. 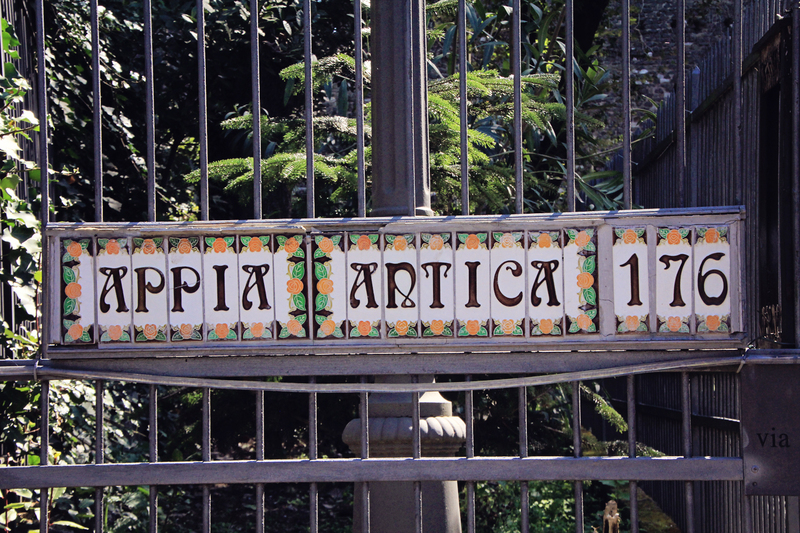 Take a bus or taxi to the Catacombs and get out and walk around the grounds and walk along the Appica Antica, taking in the sights and beauty. It’s truly a time machine back to the ancient world and along the pathway of the Grand Old Tour. 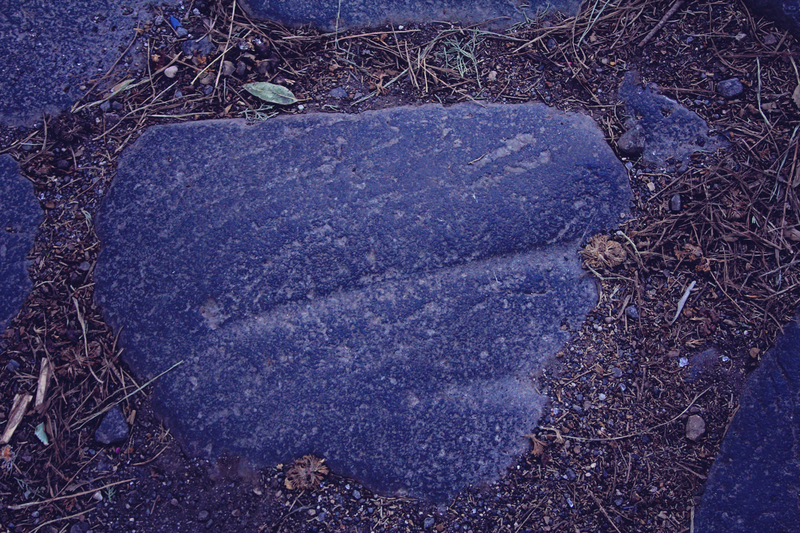 Many have walked and ridden over these stones and passed under its gates. 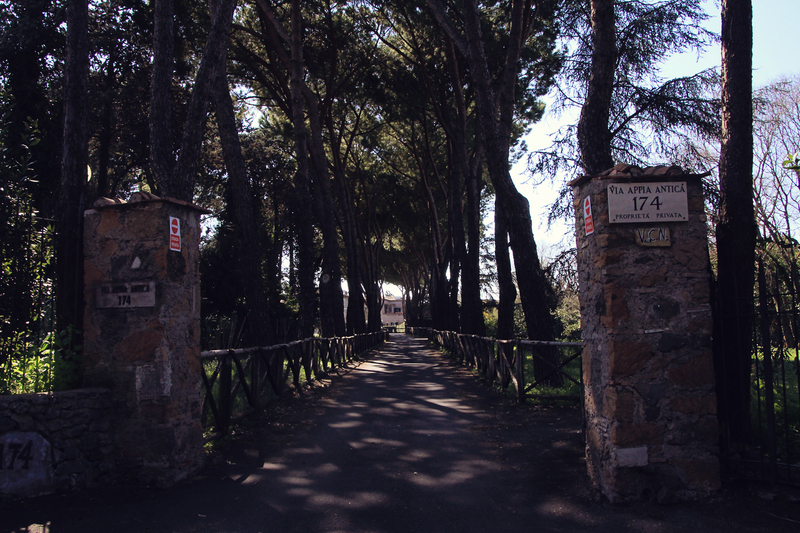 Second Part of the Photo Tour of the Appian Way to follow. 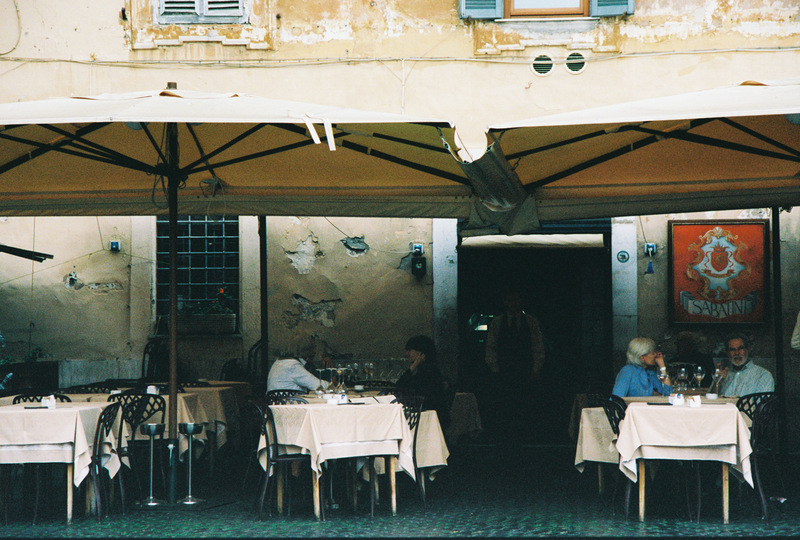 Image | March 11, 2013 March 22, 2013 | a love letter to rome and italy! I love walking down the little market walk ways under Renaissance awnings. 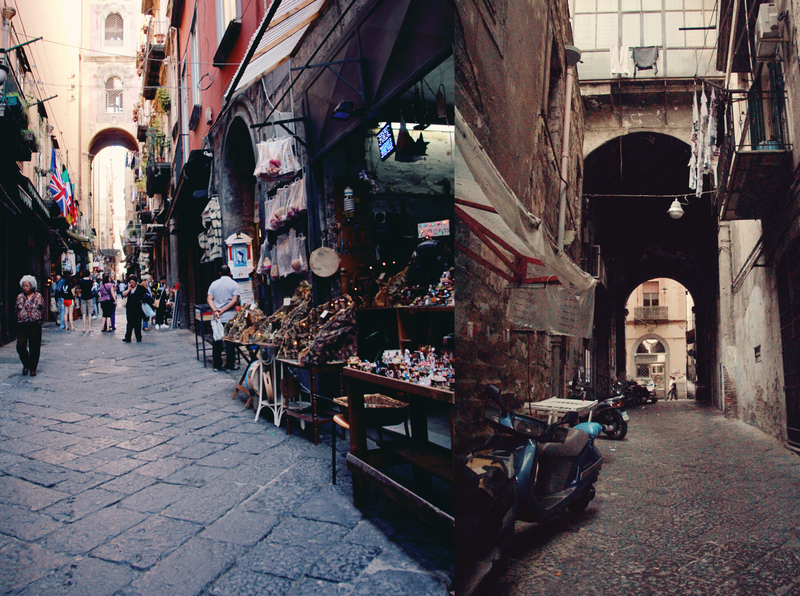 There’s nothing on earth quite like the streets of Naples. 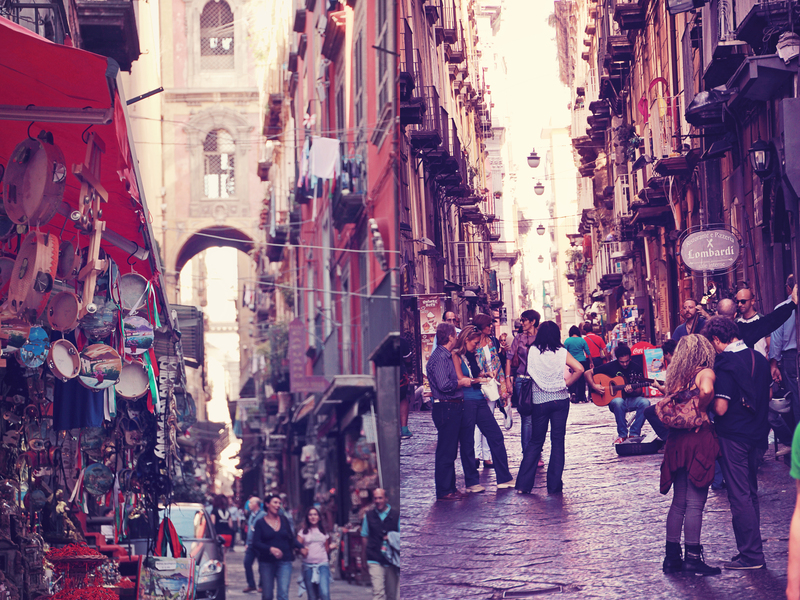 I’ve heard it said certain spots in Napoli hearken back to the ancient world, only a few other spots in the world like Calcutta can recall another time so long ago. 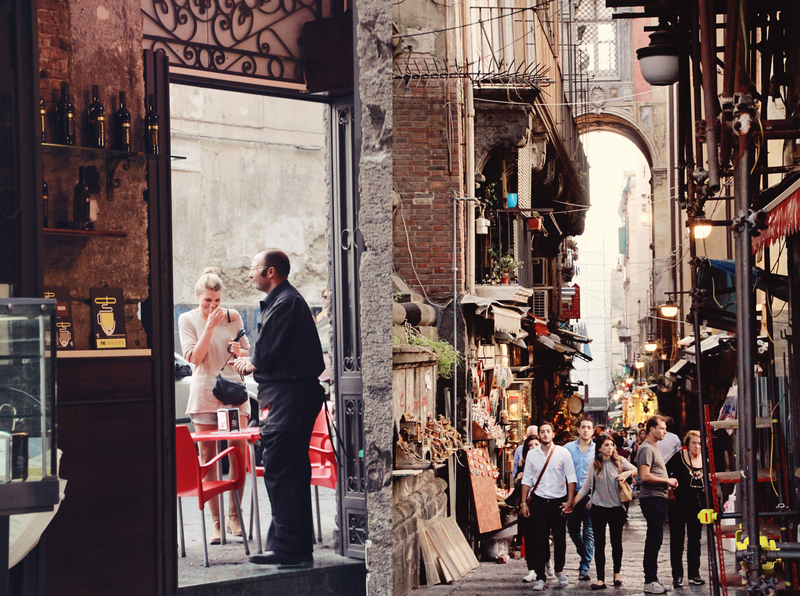 In the connecting pedestrian streets of the picaresque Spaccanapoli, Naples boasts one charming cafe after cafe another. I love the coffee of Napoli; the rich, strong demitasses of espressos, the sweet nuttiness of a nocciola (espresso, sugar and ground roasted hazelnuts), or a frothy and properly hot cappuccino. 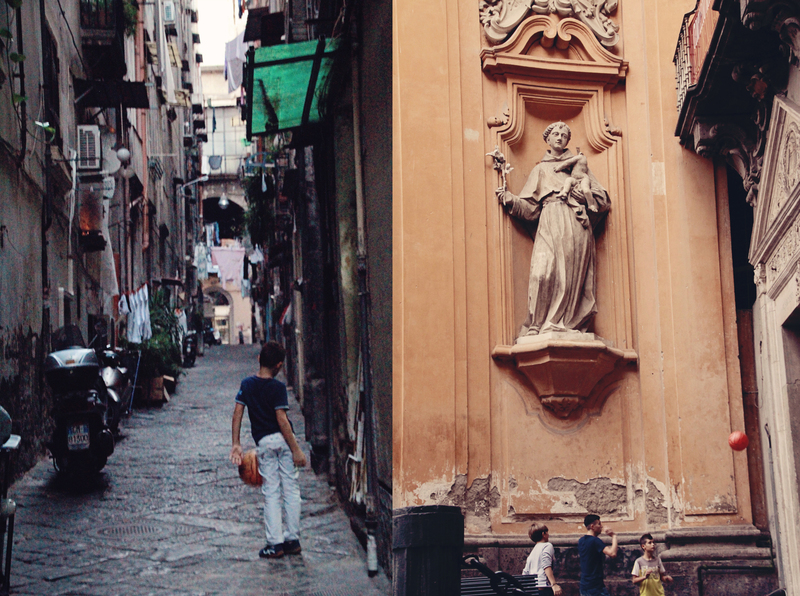 The children of Naples play in the grotty, wonderful streets against the backdrop of statues, paintings and colored walls peeling for centuries. In between the tiny fiats and citroens and three to a vespa. They find their games anywhere and everywhere, cheerfully kicking their “footballs” under the feet of passersby, in front of store windows, around fountains and niches of ruins. There is such a sense of play underneath it all. From the moment I first walked these streets a few years ago I became enchanted with the market trinkets hanging from stalls, the smell of cheese and bread, tomatoes and fish wafting out of trattorias. I loved the cobblestones, the gorgeous archways, the warm colors. I am enchanted with the best people watching in Italy. 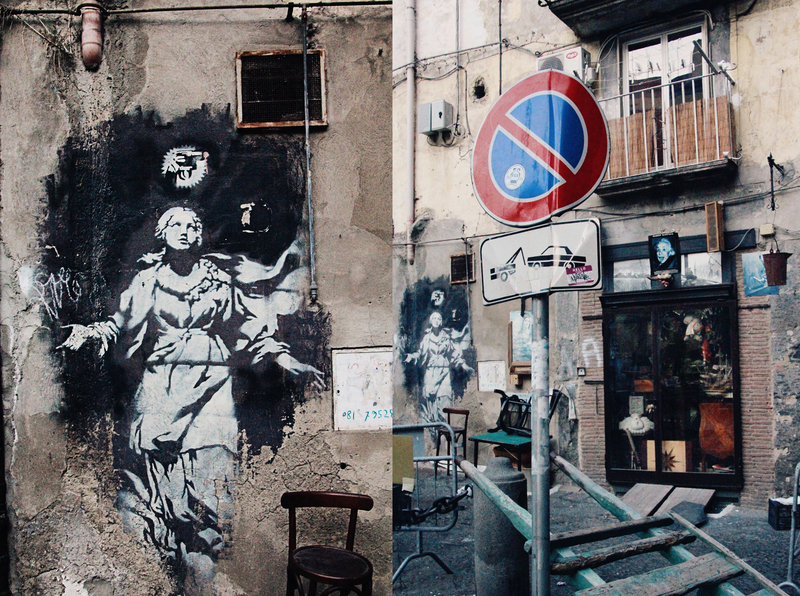 Old world art, architecture and pop culture kitsch mix in any given corner of the historic center of Napoli. There before me is amazing street art graffiti, a sticker of a carefree Einstein placed prominently over a cafe and a quiet tea shop tucked up in the most unlikely of places. There is an empty neighborhood chair left leaning against a wall amid an array of inexplicable traffic signs – there’s even a post-modern Madonna under the auspices of a revolver. 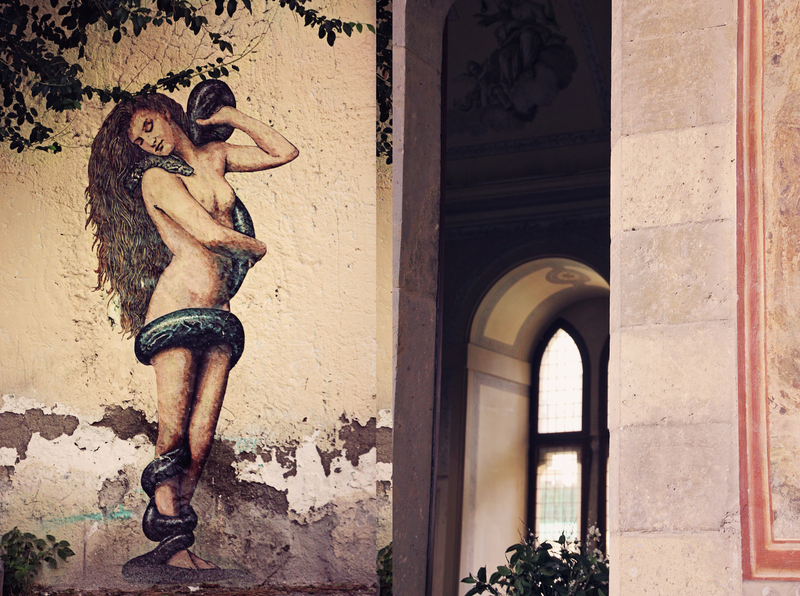 Near to the beautiful garden Cloisters of Santa Chiara, is a street art Eve with Eden’s snake, underneath an old Campania tree. The hand painted Spanish tile, fountains and arched windows of the cloisters are a near silent oasis in the heart of the city. Lemon and orange trees and flowers line the green, manicured gardens of the inner courtyard. It is a private, clean and calm spot to pop in for a little bit, for a lovely walk or a sit on a bench with a book or a friend. //photographs copyright rebecca price butler …find my work on tumblr & pinterest … please link & credit me. 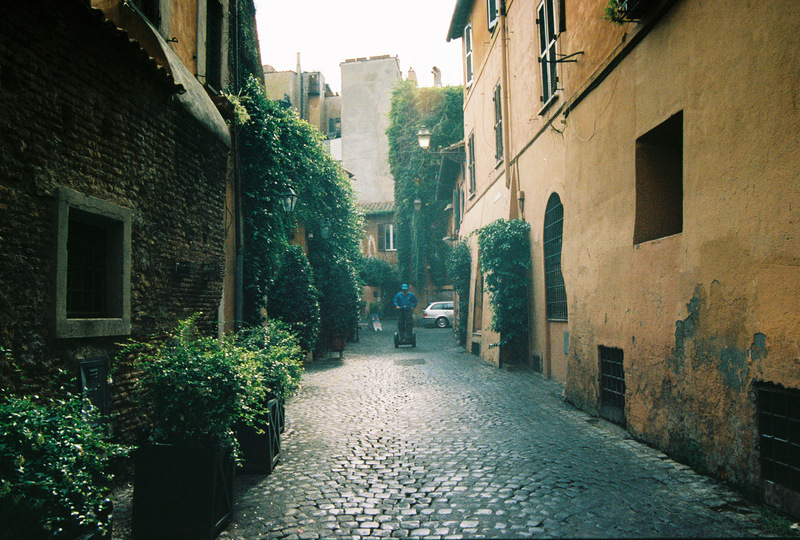 Image | March 9, 2013 March 10, 2013 | a love letter to rome and italy! 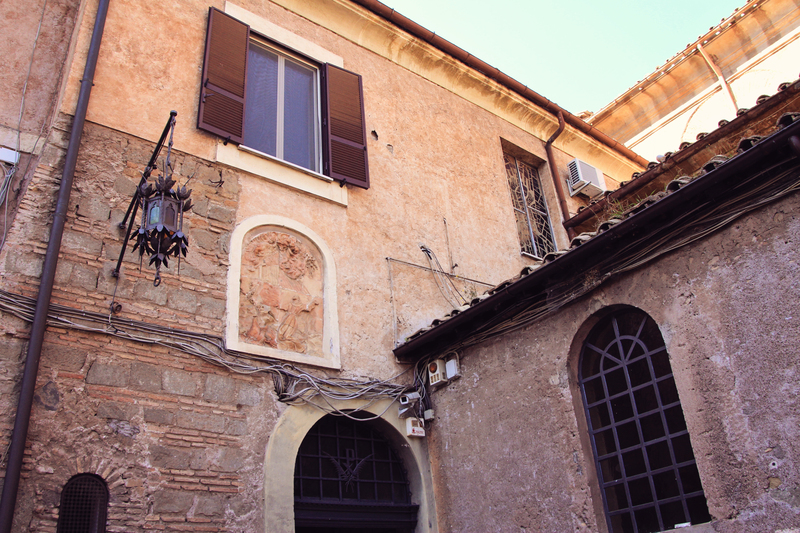 Trastevere is a charming neighborhood across the Tiber from the historic center of Rome. It’s a great spot to have lunch and spend an afternoon walking around, admiring the warm, faded colors of the buildings. They bake wonderful breads and cookies at La Renella and sell handmade chocolates at Valzoni to locals and tourists. My favorite book shop in Rome is The Almost Corner Bookshop, an all English language store filled with fiction and non-fiction dedicated to Rome and Italy, lots of great classic literature and the latest publications in English. 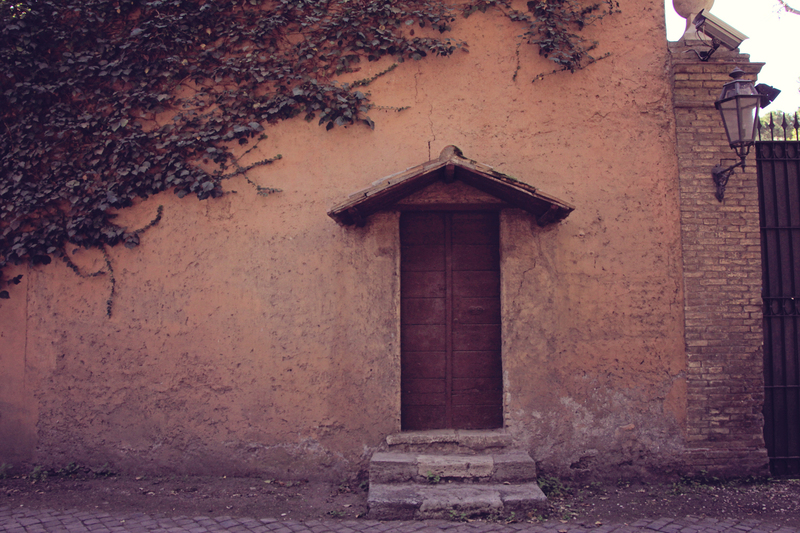 I always pick up something perfect to set the tone of my visit to Rome – in March it was Geothe’s near perfect Italian Journey, which colored my walk on the Appian Way and walking through the Porta San Sebastiano. In October it was my favorite Odes of John Keats in a neat little volume, with a little Shelley and Byron, who all accompanied me on my visits to The Keats Shelley (Byron) House and for a prosecco at Caffe Greco and even to Keats tombstone in Testaccio. 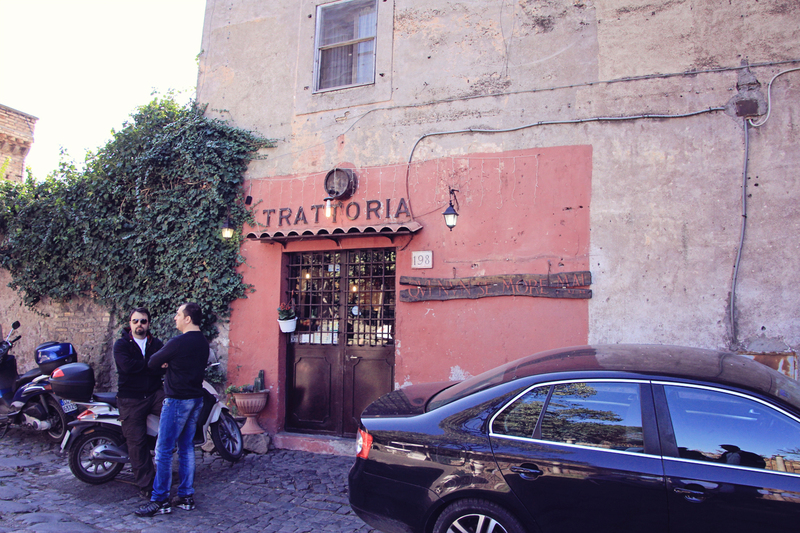 Trastevere is not usually overrun with tourists and has a little bit of an off the beaten path feel to it. 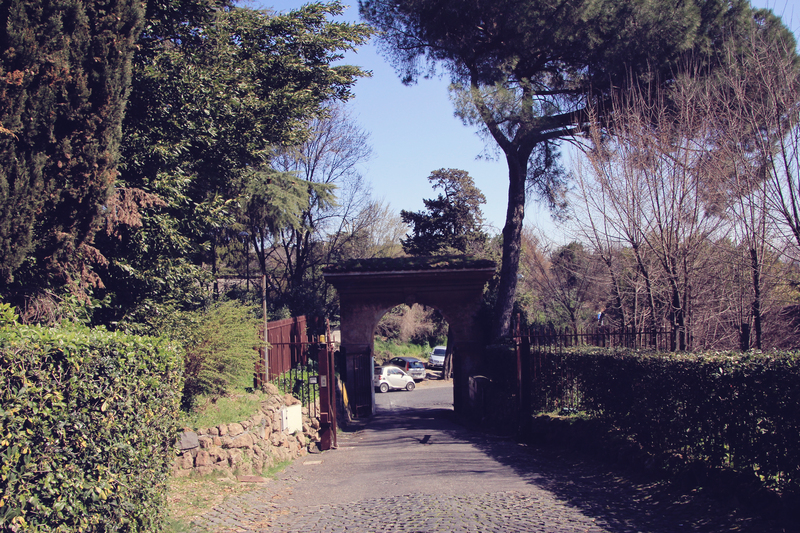 One can walk to Tiber Island for curious sights or the Giancolo (Janiculum Hill) for an alternate view of Rome or even to the residential neighborhood of Monteverde which boasts the lovely Villa Sciarra parks and is truly off the beaten path. I love the beautiful curves and colors of the architecture. 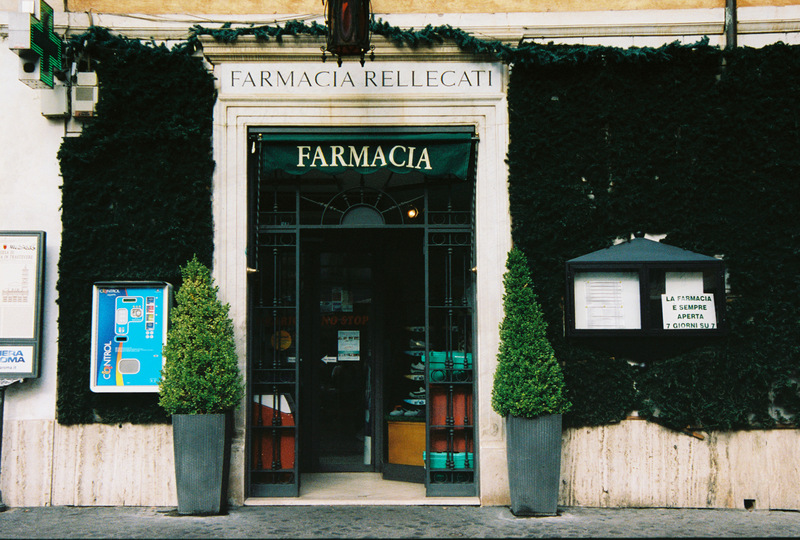 Trastevere has the chicest farmacia I’ve ever seen. Each little shop and boutique is delightful and covered with crawling greenery. 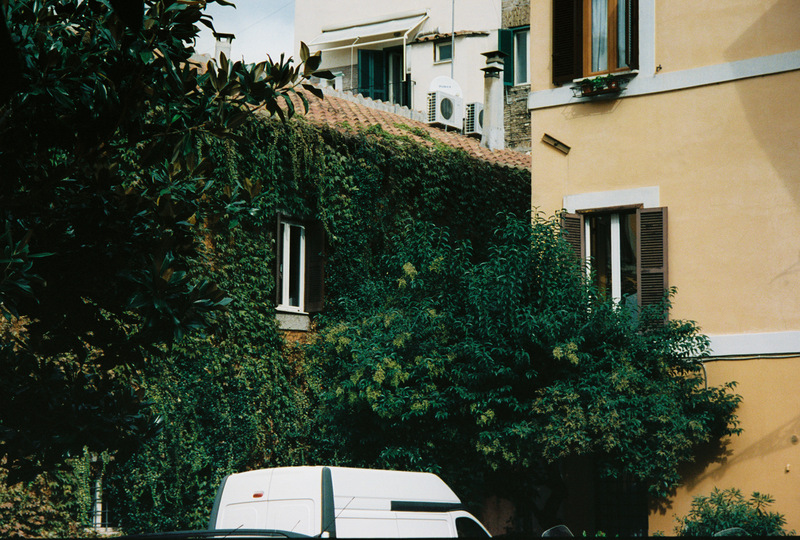 The curb appeal and doorstep gardens of Italy are an obsession of mine. 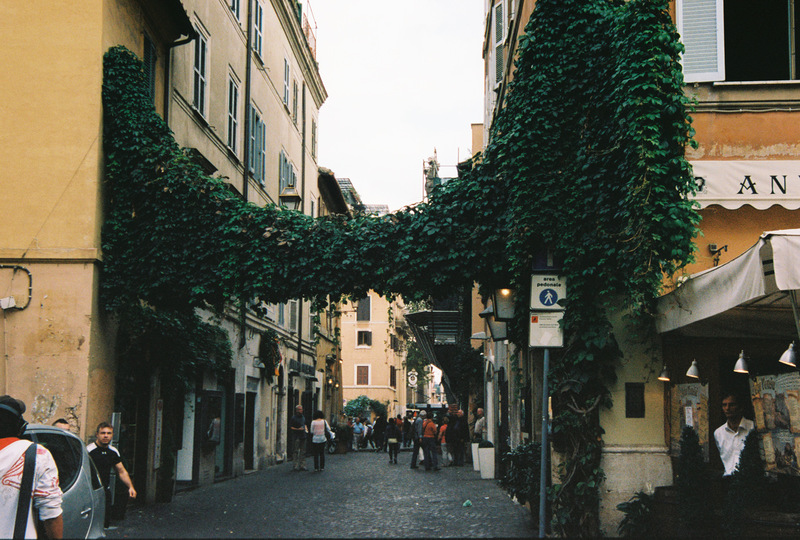 The gorgeous overhanging vines and ivy of your typical Trastevere pedestrian street next to little cafes and restaurants. The layers of stone and paint and greenery are lush all year long. I adore this section so much. A charming respite to duck in when caught in the rain (as I was that afternoon)! 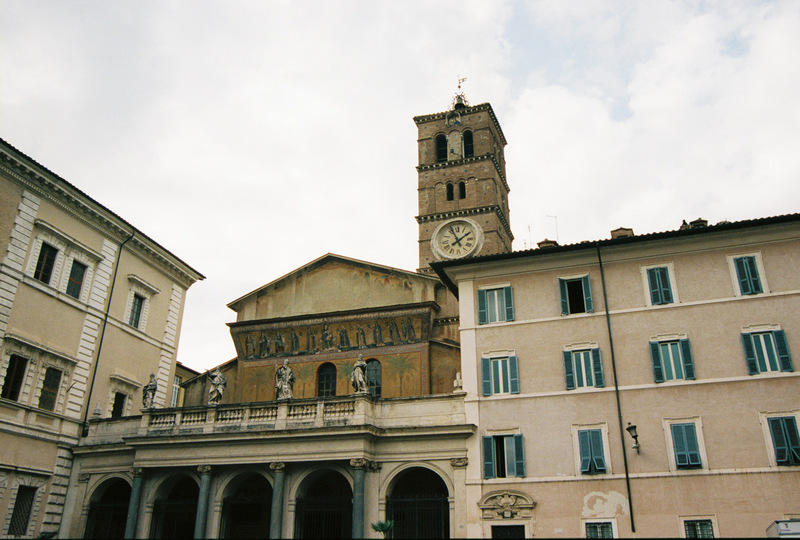 The main piazza of Trastevere with the cannot be missed church. A great people watching locale. 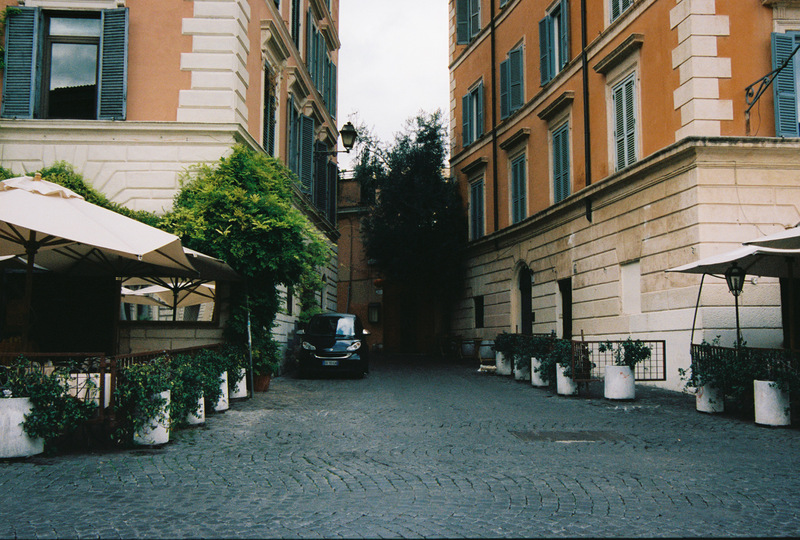 They even have the ambulatories in Rome to bounce one over cobblestoned paths. The green grows thick and spreads over garden walls. Miniature terraces with majestic potted plants which grow as long as Rapunzel’s hair! The place to see and be seen. 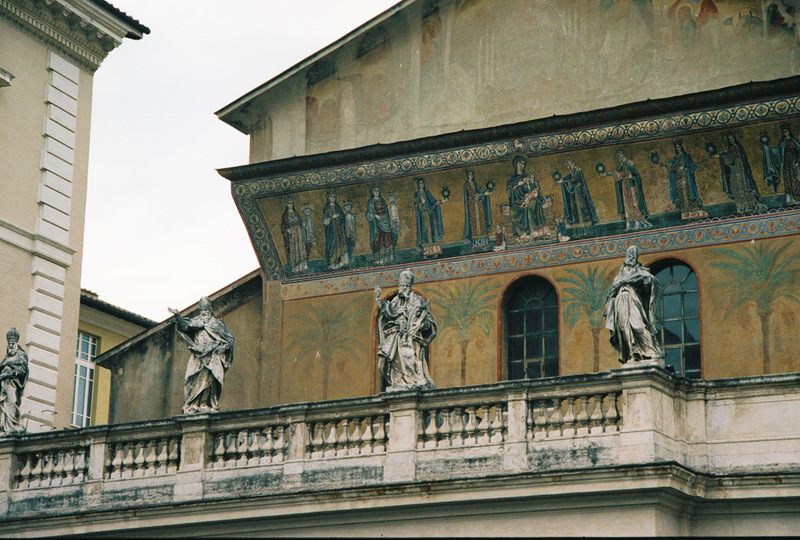 A close up of the pretty detail, with Occidental features like Egyptian palm trees and the gold leafed saints mosaics. 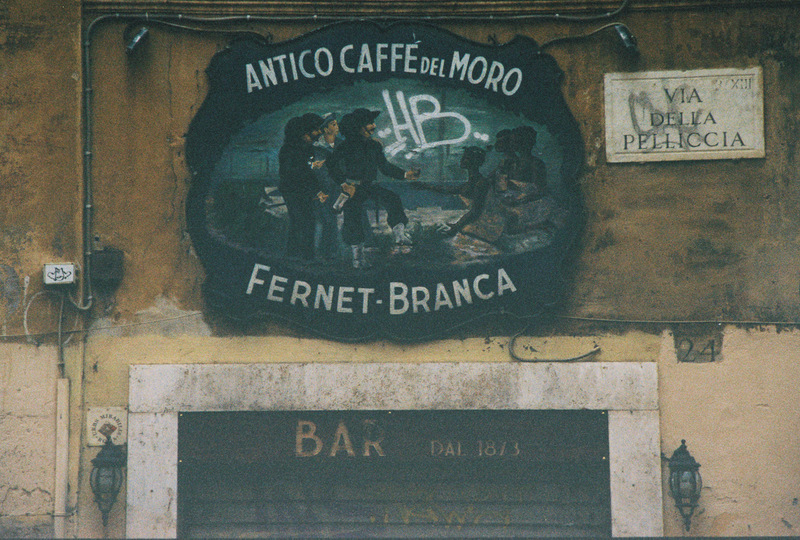 Coolest cafe sign ever. 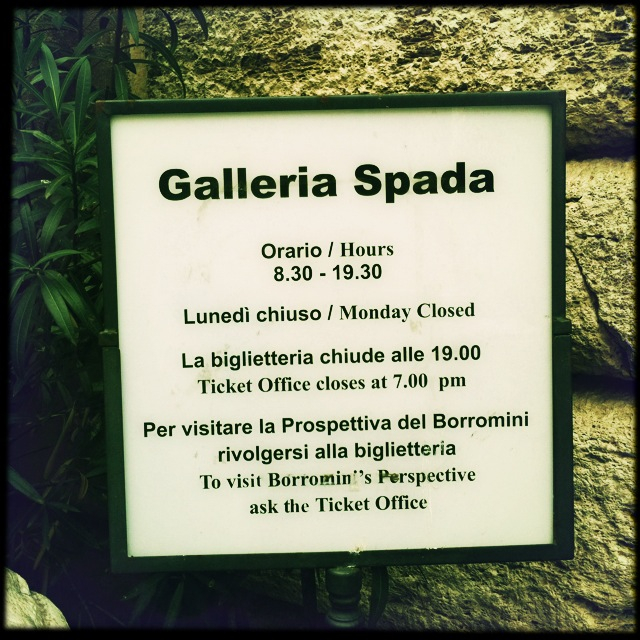 It’s always closed when I find myself in Trastevere unfortunately! Yes, it IS a terribly romantic place to get lost in. The requisite laundry shot because I never, ever, ever tire of those. And a light blue vespa! It is Italy after all! It’s a requirement for any tour. 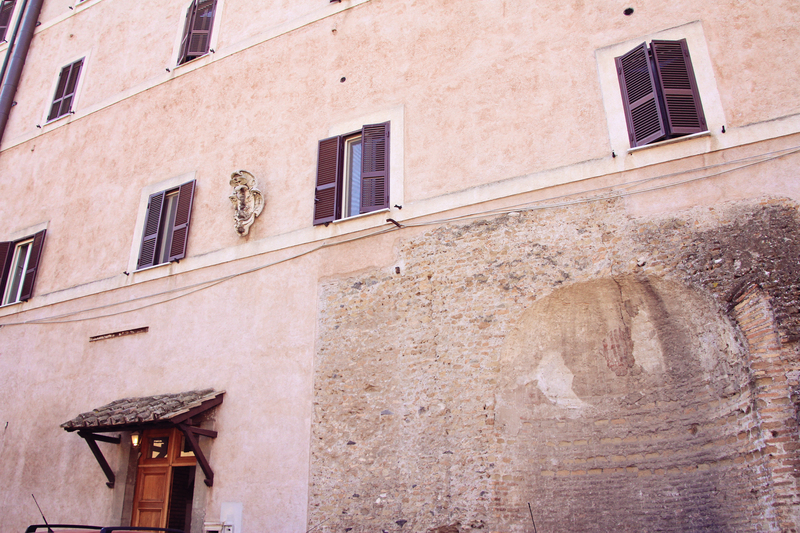 Rome – where the masterpieces are both outdoors and indoors for your viewing pleasure and contemplation. 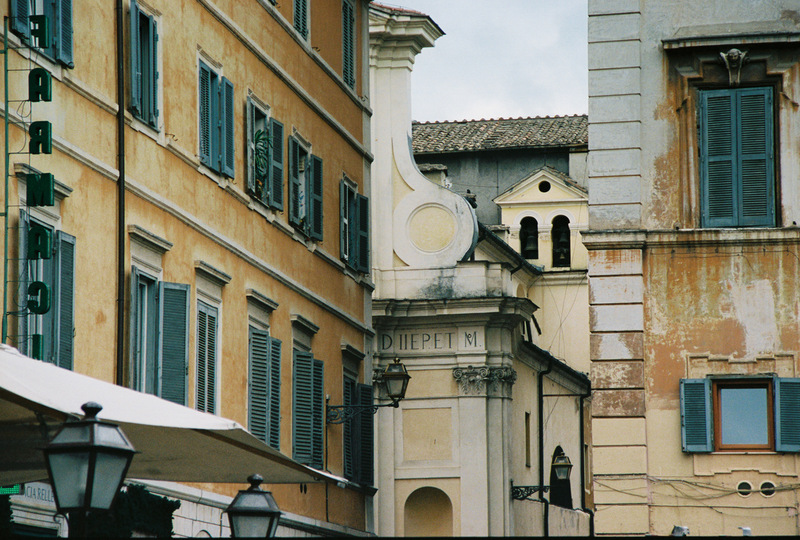 This is why I love the eternal city. It is made up of a thousand moments of aesthetic joy. These were all shot on my 35 mm film camera on a dull, grey, rainy afternoon and still the color and hues shine through the haze! 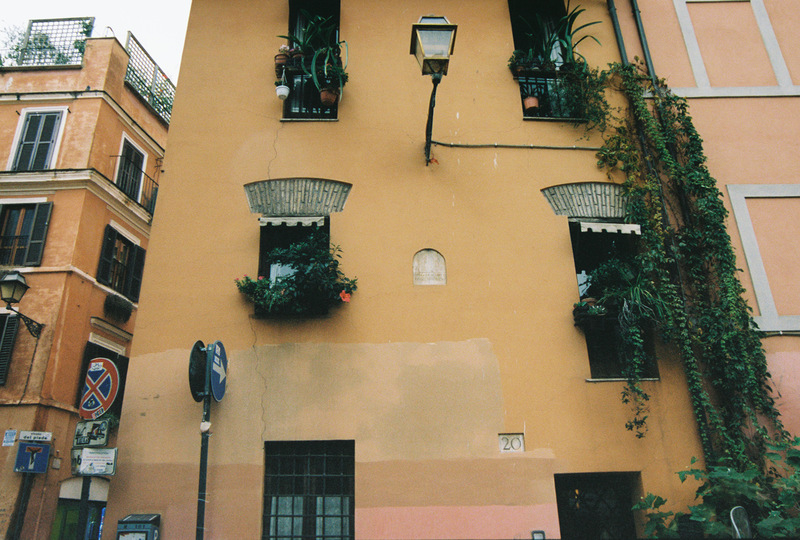 Just sequester me here to this flat with the garden-y window for a season or two… I will be happy. 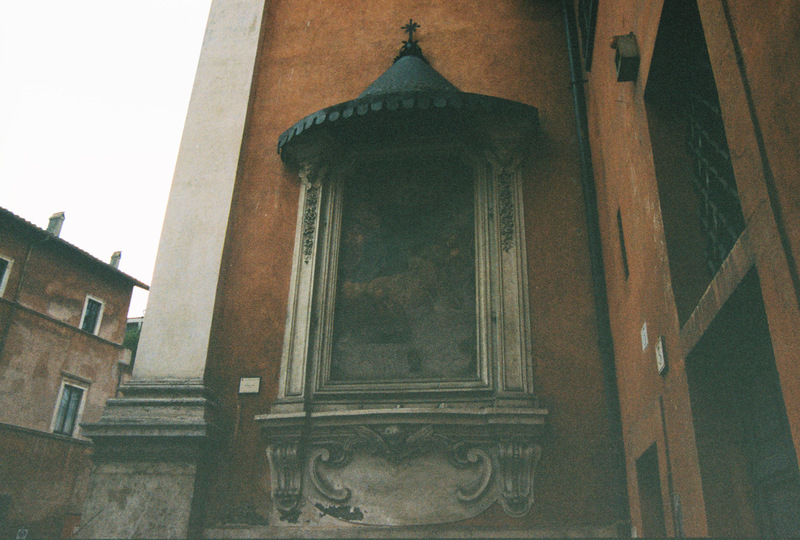 I’ll walk the streets in the morning, pop into churches and museums in the afternoon and sit Juliet style by this window at night. And all the simple people. The church, the clock, the steeple. I miss the morning dew, fresh air and Sunday school. American tourists flock to see the village green. In relation to my choosing the very British provincial music quotes is a 10 year old video featuring the song and the very amazing Lord Whimsy. 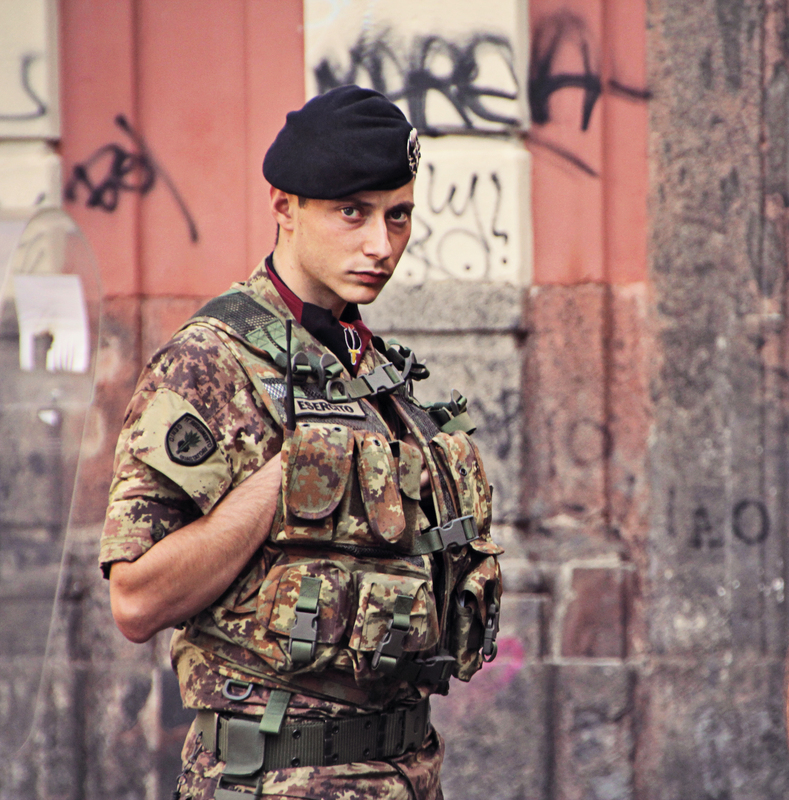 Video | March 8, 2013 | a love letter to rome and italy! An excellent little art history discussion on Artemisia Gentileschi (in french) with high quality sound and photographs. By Anne STEINBERG-VIEVILLE. Worth a look and a listen even if you don’t speak french – the image comparisons and baroque music still make it compelling. In honor of International Womans Day! (Which no-one seems to celebrate in America, but I always enjoy in Europe)! And whilst I am stuck at home in another snowstorm (the house, trees, street are literally blanketed with white) I am going to light a fire, make some tea and work on more posts about Artemisia and the intense stories behind her paintings and on sunny spring time afternoons I’ve spent in Rome chasing art and architecture and the ghost of John Keats. We’ve had some very interesting conversations on the Viale delle Magnolie. 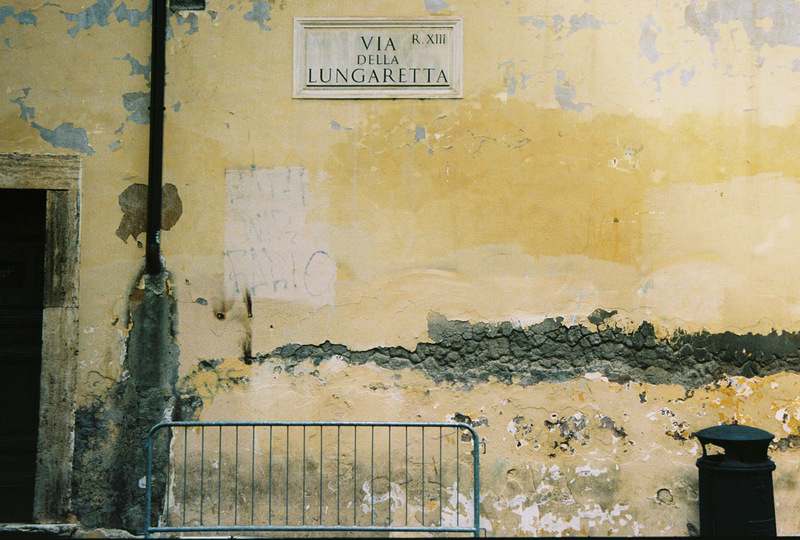 Image | March 2, 2013 March 2, 2013 | a love letter to rome and italy! 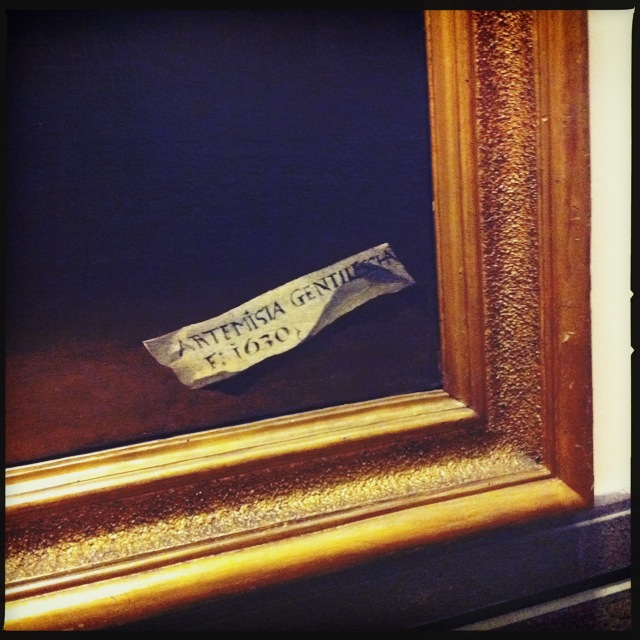 One of my favorite artists is the Italian Renaissance painter Artemisia Gentileschi. Over the years her work has been difficult to view – some times because her work was mislabeled or away for restoration or on loan to another museum. Some of her work is in private collections and is spread throughout Italy, France, England and the US. 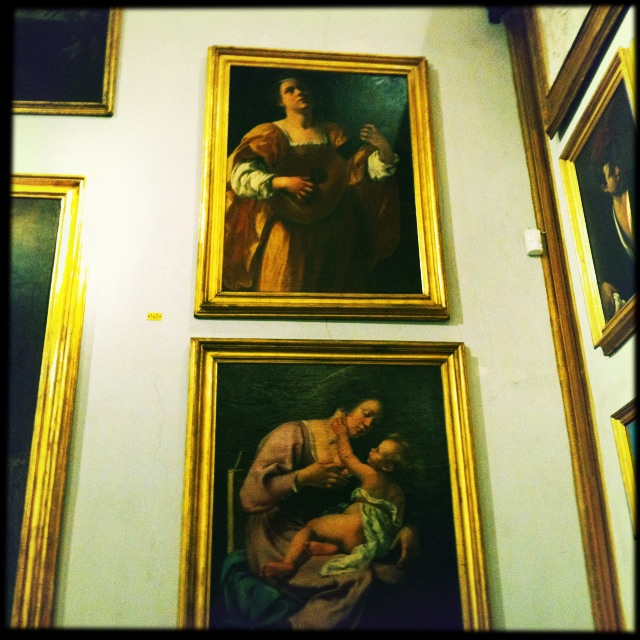 She has a handful of important works in Florence, Naples and Rome. I’ve been obsessed with seeing all her work in person and studying her brilliant work. My digital portrait of my favorite artist, Artemesia Gentileschi’s painting Judith Slaying Holofornes in Naples, Italy, October 2012. Giuditta e Oloferne di Artemisia Gentileschi è un quadro (olio su tela, cm 159 x 126) che si trova a Napoli nel Museo di Capodimonte (inv. Q 378), nella Galleria Napoletana. Judith Slaying Holofornes by Artemisia Gentileschi in the Capidimonte Museum in Naples, Italy. There are a few more of her paintings in the next room. 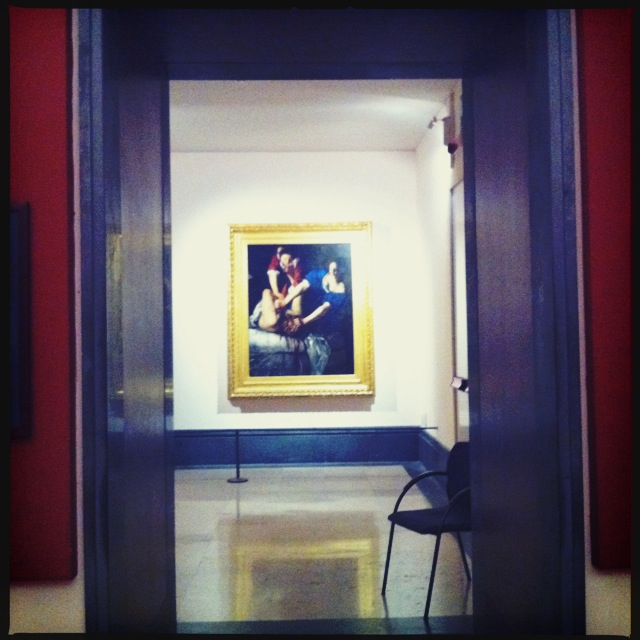 Artemisia Gentileschi’s two paintings at Rome’s Spada Gallery. 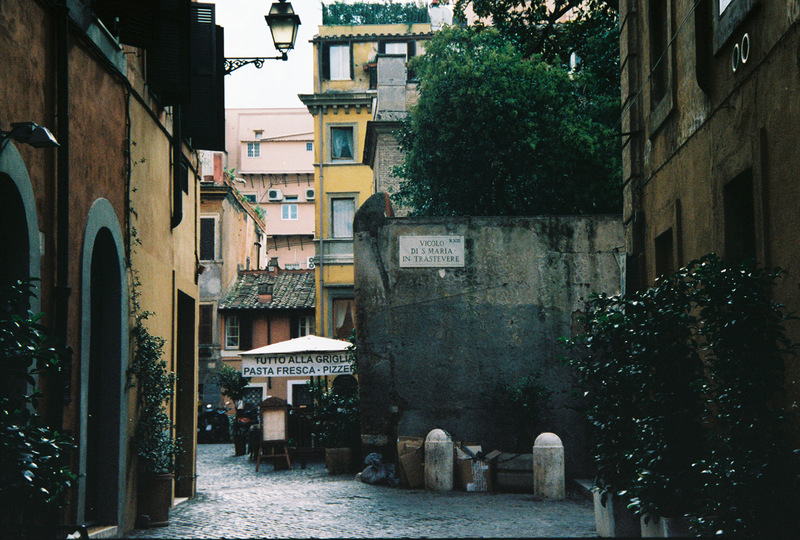 Image | March 2, 2013 | a love letter to rome and italy! 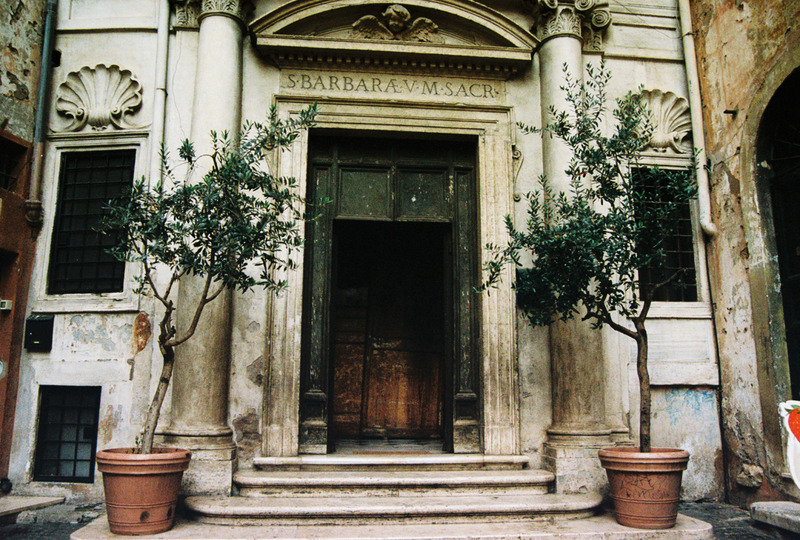 This small church, also known as Santa Barbara alla Regola, after the district in which it is situated, was founded, in the 11th century, in the ruins of the Theatre of Pompey. 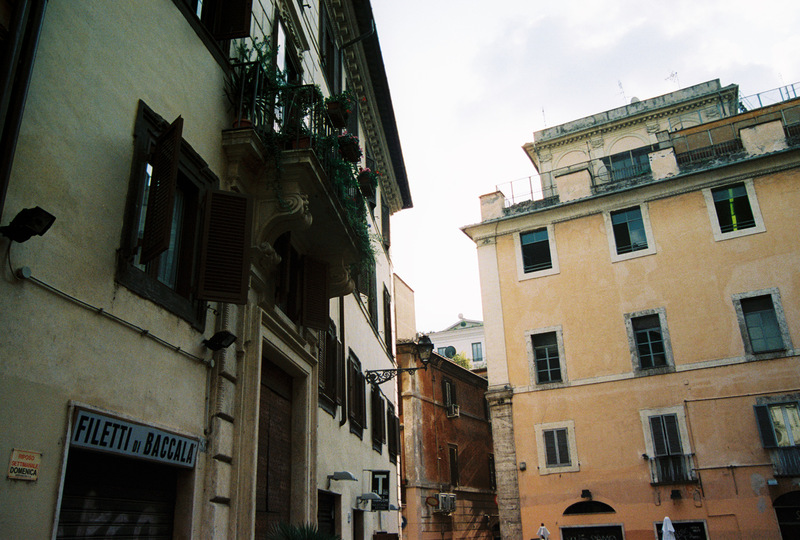 (It was in an annex in the gardens of the Theatre of Pompey that Julius Caesar was assassinated). 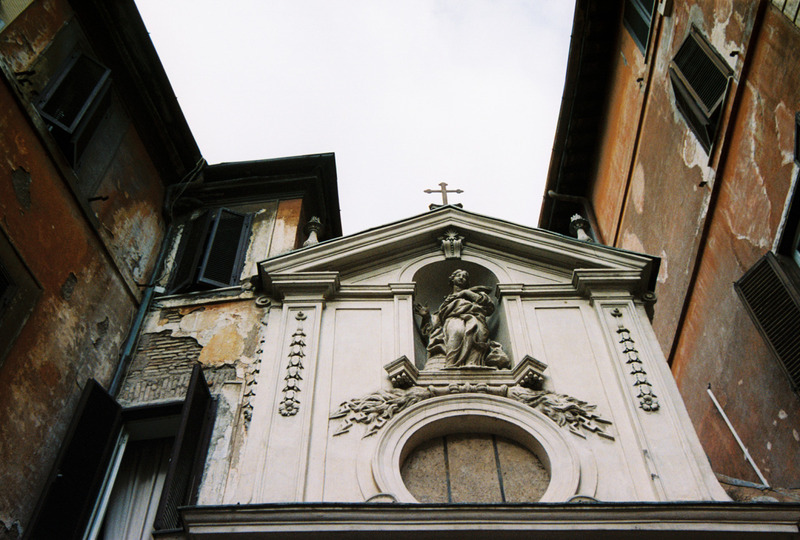 The church is just off Via dei Giubbonari between Campo de’Fiori and Piazza Cairoli. This is a small but absolutely stunning church. It’s definitely an off the beaten path small church. One minute you are walking through a charming neighborhood, the next moment your turn the corner and are stopped in your tracks by this glorious architecture. 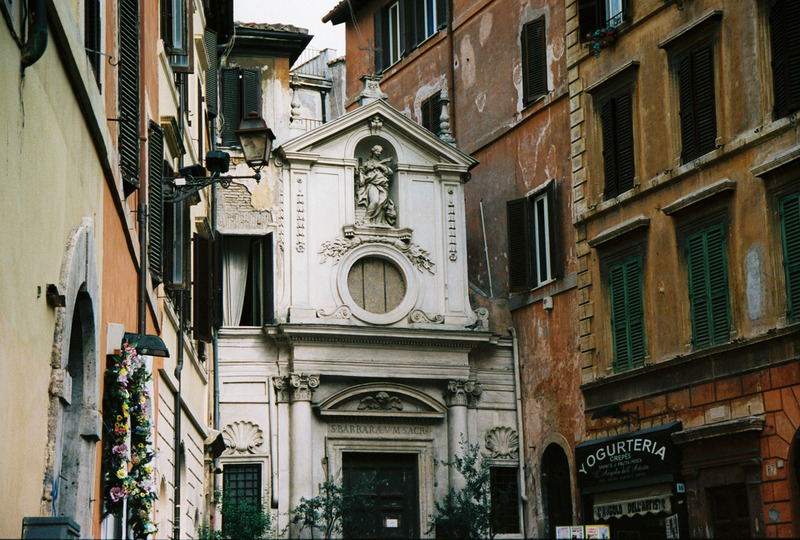 It looks surreal – a tiny church stuck between houses and a yogurt gelato shop. It’s worth a stop, a snapshot and a walk up past the perfect olive trees into the doorway for a look around the interior. The video below is a literal film walk through the church. Armchair travel at it’s finest.